When Hell is full of dead Archetypes . . . just open up this tome and hand out more! Fresh from the brains of our most rabid All Flesh Must Be Eaten fans comes more zombie madness. 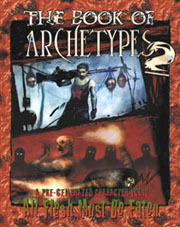 The Book of Archetypes 2 turns the screw a little tighter and kicks it up a notch. Players can choose from folks like those found in the Book of Archetypes, as well as additional Inspired Archetypes and those designed for use with the All Flesh Must Be Eaten supplements Enter the Zombie, Pulp Zombies, and Fistful o' Zombies. So what if your current character has given up his brain to feed the masses. Crack open this book and start spreading the love . . . and bullets once more. • More than 30 new Archetypes for you and your players to place in harm's way! • Each Archetype comes complete with personality, quote, gear, full game stats, and ready-to-eat gray matter! • More equipment and rules to promote massive hemorrhaging! This supplement contains material written by fans of the All Flesh Must Be Eaten RPG.